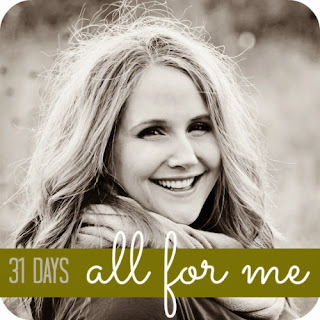 I am going to do the 31 Day Challenge with the Nesting Place! Please notice that it's 11pm on October 1st and I'm just signing up for this. Procrastinate much? I've tossed around several ideas and none of them got me that excited or really challenged me with something I needed to be challenged in. Until tonight, after a really hard stay at home mom day (feel free to read, week) my hubby told me to get out and take a night off. Instead I stayed home and worked my tail off to get our house completely in order. Instead of leaving the laundry basket filled and the bath tubs dirty and having a night just for me, I stayed. I wanted to stay, I wanted this stuff done. But I should've gone. I have VERY little time to myself with the exception of when I wake up early to spend time with Jesus before the girls are up and after Chris has left (poor guy leaves at 5am every day). I knew that when I signed up to be a stay at home mom, so I'm not complaining. But I still need to do things that I find enjoyment in. I've let myself and my interests disappear too much. I'm too busy making sure everyone else is OK. I'm ridiculously bad about asking for help or saying no to others. I'm ridiculous good at doing 10,001 things at once, none of which might be things I enjoy. I'm not saying I'm a crazy selfless person that should be honored and adored (ha!). I'm not even saying you have to love every second of your life. I'm just saying I've been hiding in the shadows unnecessarily and depriving myself for deprivations sake. It's been pointed out by more than one person now that it's time I be a little selfish (thank you dear friends... and Jesus). That doing this wouldn't make me a bad Christian, wife, mom, friend, volunteer, teacher, etc. In fact, those areas would probably all see a huge improvement too. things I've done all for me each day. DO at least one thing a day just for me. I'm sure you will be sitting by your computer anxiously clicking refresh each day to see what mind numbingly mundane thing I've done that day. If that's you, feel free to check back in on this post. I'll keep this list updated with a link to the post for each day.